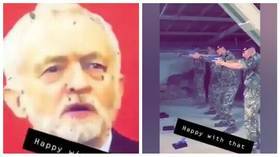 Ex-Army Sergeant, Trevor Coult, posted the footage on Twitter saying: “Not looking good for a Labour leader.” Coult has since deleted the 26-second clip that seemingly originates from Snapchat. The Ministry of Defence confirmed that the video, showing British troops shooting a Corbyn image at a shooting range in Kabul, is genuine. The footage prompted outrage on social media with many reminding Coult that Labour MP Jo Cox was murdered less than three years ago. Some pointed out that other British lawmakers have also had threats on their lives and that this comes a day after a neo-Nazi was convicted of planning to murder a Labour MP Rosie Cooper. If genuine, video of soldiers on a shooting range in Kabul firing at a target of Jeremy Corbyn, coming a day after a neo-Nazi was convicted of planning to murder a Labour MP, should be acted upon by the MoD. Shocking, whatever your political outlook. Coult has since claimed the image of the Corbyn poster was photoshopped, claiming on Twitter that it’s a “pity it wasn't real!” A tweet he has since been deleted.